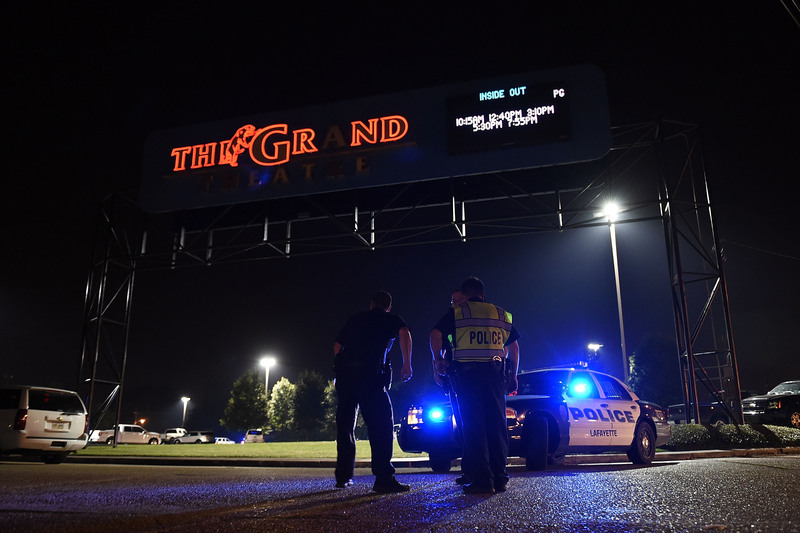 While attacks on theaters are certainly the exception rather than the rule, the eerily similar circumstances between the 2012 shooting in Aurora, Colo., and the shooting in Lafayette, La., on Thursday have reignited questions over whether movie theaters are actually safe. Just last week, Aurora gunman James Holmes was convicted on 166 charges, including 24 murder counts, for killing 12 people and injuring another 70. The shooting in Lafayette, which took place during a 7:10 p.m. screening of Amy Schumer's Trainwreck, left at least three people dead, including the still unidentified gunman, and nine others injured, authorities said. With these two cities now forever tragically connected, the conversation has expanded into whether the moviegoing experience could change to accommodate new security measures. Movies are set up to let people escape into a story or a character's life. But when you think about it, theaters are an exception in today's world. You pay money to sit with strangers for hours in a dark room, yet for most theaters, there are no required bag checks like at an airport or body searches like at concerts. Anyone can walk in with a ticket, as did the 59-year-old male shooter, and often side doors are left unguarded. Grand Theatre's conduct policy is posted on its website and says people are prohibited from bringing in firearms. CNN reported the chain's venue in Lafayette had a small sticker on the front door that signaled guns were banned. (Louisiana has an open carry gun policy, which means people are allowed to carry firearms in public.) But like other movie theaters across the country, the Grand Theatre did not appear to have additional security measures such as metal detectors or trained security guards. After the shooting in Aurora, some minor safety procedures were quietly put in place to tighten security at Cinemark theaters. But some shooting survivors and relatives of victims thought the move was too little too late. In April, a federal judge set a July 2016 trial date for 20 civil suits filed against the theater's owner. The lawsuits alleged Cinemark should have foreseen and prepared for a potential mass shooting, part of which, the suits claim, should have included better security. Holmes entered the theater through an emergency door before unloading dozens upon dozens of rounds from an assault rifle on the audience. Officials may never be able to definitively say that Lafayette is a copycat of Aurora, and it's hard to say whether theater chains will be mobilized to try and better ensure customer safety. But the senseless attack on what should be a safe space for entertainment will undoubtedly make people think twice about whether movie night is better had at home.